In 2006, LAYERS opened its second outlet in Nagoya Hill Mall Food Street - A&W Area /beside Pop corn. It was named 'WANG LAI' point. It was the first and only Kue Lapis Specialist in Nagoya Hill, offering fresh bean puff / pias and kue lapis. 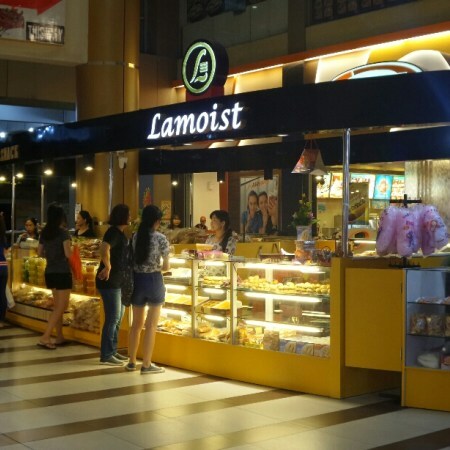 The Lamoist become everyone's favourite at the year end festive celebrations- and are widely served and enjoyed as festive delicacies. Well, Indonesian born cake is actually loved and craved by everyone - but only on festive seasons. In 2010, the Kepri Mall service point was opened to cater for expatriates and everyone who live near the Sukajadi area. The address is at Food Street near Gate 2. It also acts as the pick up point for customers residing at Batam center and Nongsa area. Our second Ferry Terminal Pick up and Sales point was opened in 2011 in Sekupang International Ferry Terminal - Departures (lev 2), which enstrangthen our commitment in bringing excellent cake and service to our Singaporean friends. In 2011, our outlet in Nagoya Hill Mall was too small to serve increasing numer of customers. It then expanded to the corner area near escalator to Hypermart @ food street. It was also marked by the birth of traditional kue lapis range, for those who can't get the spiced flavors of their mind when talking about kue lapis. This is also the year where LAYERS BATAM was awarded recognition by the GOLDEN CHURN butter Manufacturer in Australia for using their best quality butter.